For most of human history, we effortlessly consumed (nose-to-tail) the things we needed for strength, health and happiness. Like the fertile ground that we once walked upon, we were a natural extension of this earth. In the modern world, we unknowingly struggle to fulfill our nutritional needs in order to support and sustain a vibrant, disease-free life. We are now part of a world where immune system maladies (inclusive of allergies, food sensitivities and autoimmune conditions) run amuck. [ To a very large extent, the health of the thymus determines the health of the immune system. Individuals who get frequent infections or suffer from chronic infections typically have impaired thymus activity. Also, people affected with hay fever, allergies, migraine headaches, or rheumatoid arthritis usually have altered thymus function. Whole food, nutrient dense organs and glands can provide great benefit for those seeking targeted support in harmony with nature — the old fashioned way, the way that our early ancestors did. 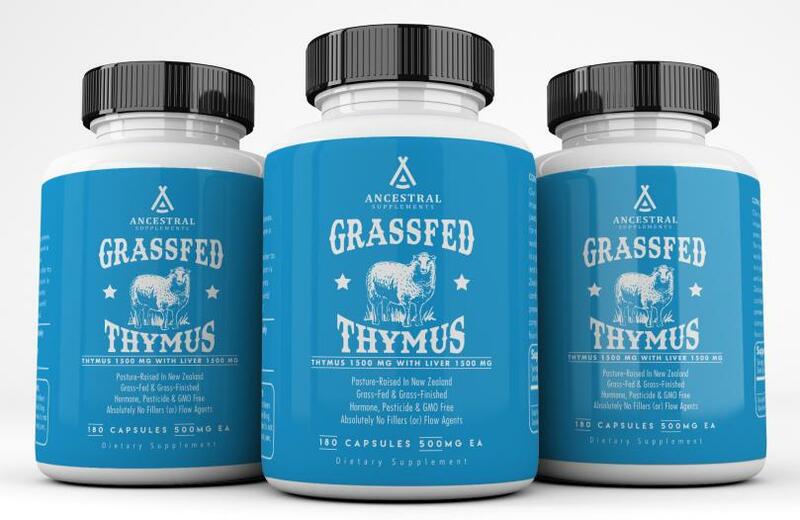 Grass Fed Thymus is a whole food dietary supplement that provides 100% pure ovine thymus (with bovine liver). This whole food provides proteins exclusively expressed in thymus tissue as well as various peptides and hormones such as thymosin, thymopoietin, and serum thymic factor, that regulate many immune functions. * Our mission is our purpose... putting back in, what the modern world has left out. Our nose-to-tail product line is always from grassfed, inspected animals born and raised without the use of pesticides, hormones or antibiotics. Health of livestock used for manufacturing in New Zealand is closely monitored by a world-leading biosecurity system that is second to none, and is a global exemplar. Strict government licensing, auditing and certification procedures mean that our genuine New Zealand freeze-dried products can be used with complete confidence in their origin, safety and efficacy. Freeze-drying preserves the heat-sensitive vitamins, minerals and co-factors of components leaving the nutrients in the same balance as found in nature. Organ meats were a staple of our early ancestors' diets as the ultimate superfood, for good reason. It turns out, this nourishing tradition is backed by science... "Radioisotope labeling studies in animals have shown conclusively that, when eaten, organs and glands selectively travel to the corresponding organs and glands in high concentrations. This research, done at the University of Scotland in Edinburgh, lends credence to the ancient practice of eating animal organs to help ensure health in one’s corresponding organs..." - Dr. Ron Schmid, ND. * Our early ancestors knew this, which is why their traditional diets included the frequent and nourishing consumption of nose-to-tail organ meats. Six capsules provide the equivalent of one ounce of fresh, raw whole glandulars and organs that you’d get from your local farmer (or) butcher. 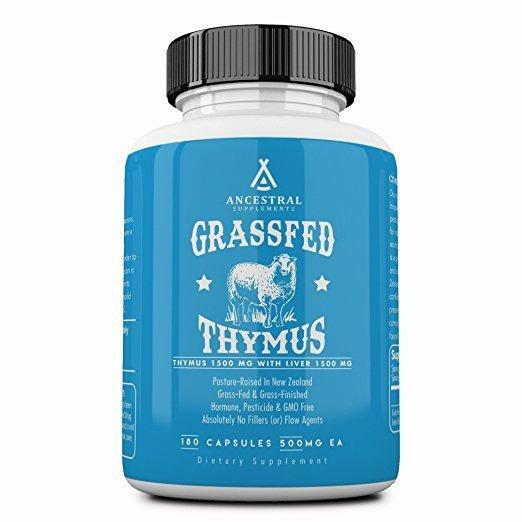 Our Grass Fed Thymus (with liver) is a whole food dietary supplement that can be taken with (or) without food (even though it technically is food). The suggested use is 6 capsules a day or as directed by a healthcare professional — for added support, the dose can be doubled. This supplement can be consumed all at once, or divided servings throughout the day. Okay, you're convinced! You're going to start incorporating organ meats in your routine because, well... you're educated now... you understand, just as our early ancestors did, that they provide superlative health benefits that are missing in our modern diets. The next step is sourcing it. It's important that you source the highest quality because not all organs and glands are created equal. Consider the source. Not all organs and glands are the same. Look for the highest quality thymus glandular... It should come from pasture-raised, grass-fed sheep (or) calves that are hormone, pesticide and GMO free. If considering a supplement, look for one that is ultra pure (without binders, fillers (or) flow agents) and look for the freeze dried variety as these have been shown to optimally preserve nutritional factors, growth factors and co-factors. NOTE: Desiccated thymus (or) whole thymus glandular can be found on the market by various names: whole thymus, thymus extract, desiccated thymus, thymus glandular, thymus PMG and ovine thymus (sheep). Cold exposure benefits include boosting heart health through improved circulation and increased tolerance to stress, upgraded immunity, and enhanced metabolic flexibility. Rhonda Patrick, PHD writes “cold exposures increase cold shock proteins including one in the brain that repairs damaged synapses and in muscle prevents atrophy, how cold-induced nor-epi-nephrine lowers inflammation and pain by decreasing the levels of 3 inflammatory mediators…”* This is very, very interesting stuff and it's grounded in evolutionary science. Give it a try. Start with cold / hot shower contrasts for 30 seconds at a time. At first, you'll down right hate me for it because it is down right uncomfortable. Continue the shower contrasts over a 30 day period. Take notice how you feel afterwards... it will keep you coming back for more. It gets easier and easier because the adaptive mechanisms, including the smooth muscles that line the blood vessels, adapt... they get stronger, faster and more efficient at doing what they were designed to do. You will notice that your ability to withstand cold will increase considerably after only a few days. Like any other stressor, we adapt… it gets easier… and it starts to feel amazing. On the hierarchy of health decisions, sleep trumps almost everything else. It's the low hanging fruit that can affect health metrics more than just about anything else. It's the time when your body and your brain detox, recover, rebuild and restore. How amazing is your sleep? Exactly what I thought! Instead of writing a long boring article about sleep tips, I'm bullet pointing this one.. why... because it's getting late and I need to get some shut eye. Get morning sun exposure (at the same time everyday) to regulate sleep / wake cycles. Finish your last meal at least 3 to 4 hours before bedtime... trust me, you can do this. Earthing... you can do it the old fashioned way or you can use grounding sheets like we do (Google it). We go on barefoot hikes all the time... we use an EMF meter to make sure there are no electrical fields around our bed... we turn off the wifi (actually don't have wifi but you do, so turn it off at night)... put your phone in airplane mode and make sure that there are no electronics (nor lights) anywhere near you. Your sleep temperature should be between 64 and 68. Use blackout curtains and blackout blinds... room needs to be pitch black. No battery lights, no night lights, nothing! Use Himalayan salt lamps at sunset instead of regular lighting. Wear UVEX safety goggles at least 2 hours before going to bed... this one is seriously a big deal. They cost $9 and they make all the difference. If you're not going to do anything else, do this! Last but not least, sleep on the floor like our tribe does... why you ask... because our bodies were never meant to be in a cast, courtesy of your bed, all night. Why do you think you wake up feeling like a stiff Rick. Katy Bowman is a biomechanist and author of Move Your DNA. She sleeps on the floor. She got us sleeping on the floor. If you want to know how to do it, check it out here. IF ONE HAD THEIR Thymus REMOVED, HOW WOULD Thymus GLANDULAR WORK? If one had their thyroid removed, not only would Thyroid glandular still work, it would be necessary for life because each and every cell requires thyroid hormone (T3) for energy metabolism and mitochondrial signaling. Same goes for the pancreas... if one had their pancreas removed, pancreas glandular (and pancreas producing enzymes and peptides such as insulin) would be necessary to sustain life. As it relates to having the spleen removed, our biology still expects spleen producing peptides such as tuftsin, splenopentin and splenin which further support and modulate the immune system (by stimulating macrophages and enhancing natural killer (NK) cell activity). The thymus gland is no different, our biology still expects thymus producing peptides such as thymosin, thymopoietin and serum thymic factor in order to heal and be healthy. The elegance of animal physiology is that glands secrete peptides and other chemical-like substances that exert downstream effects at the cellular level. If one has a certain organ / gland removed, the body still expects those peptides and other chemical-like substances at the cellular level. What's more is that many of our functional healthcare practitioner accounts use glandular therapy for this exact purpose... that is, to provide the otherwise absent glandular nourishment that our cells need and expect for strength, health and happiness. Murray, Michael T., Joseph E. Pizzorno, and Lara Pizzorno. The encyclopedia of healing foods. 3rd ed. Place of publication not identified: Time Warner International, 2006. Print. “Thymus Extracts.” Thymus Extracts | Michigan Medicine, www.uofmhealth.org/health-library/hn-2916001. Accessed 17 Aug. 2017. Ronzio, Robert, Ph.D. "GLANDULARS - PROTOMORPHOGENS." DCNutrition.com. N.p., n.d. Web. 17 June 2017. “a natural remedy alternative pharmacy dedicated to a non pharmaceutical approach to Aging, Cirrhosis, Fatigue, Cancers & more.” Thymus - Organic Glandular | Organic Pharmacy, organicpharmacy.com/supplements/thymus-organic-glandular. Accessed 17 Aug. 2017. Frtiz, Heidi, MA, ND. "Glandular Extracts - Traditional Medicine for the Modern Times." New Roots Herbal. N.p., 13 Sept. 2016. Web. 17 June 2017. Suttie, Emma, D.Ac, AP. "The Spleen - How To Have A Healthy, Happy Spleen With Chinese Medicine." Chinese Medicine Living. N.p., 11 Apr. 2017. Web. 22 June 2017. "Beef, variety meats and by-products, thymus, raw Nutrition Facts & Calories." Nutrition Data know what you eat. N.p., n.d. Web. 22 June 2017. Carney, Scott, and Wim Hof. What doesnt kill us: how freezing water, extreme altitude, and environmental conditioning will renew our lost evolutionary strength. Brunswick, Victoria, Australia: Scribe Publications, 2017. Print. Patrick, Rhonda, Ph.D. "New 20-page report on cryotherapy just released! Cold shock boosts nor-epi-nephrine up to 5-fold & increase type of immune cell that kills tumor cells." FoundMyFitness. N.p., n.d. Web. 17 June 2017. Valenzuela, C., D. L. De, M. Olivares, M. S. Morales, and F. Pizarro. "Total iron and heme iron content and their distribution in beef meat and viscera." Biological trace element research. U.S. National Library of Medicine, Dec. 2009. Web. 28 June 2017.